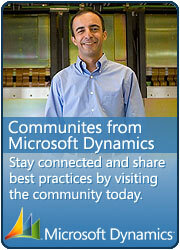 I’m a Dynamics CRM Consultant based in United Kingdom. I have been working with Dynamic CRM system since last four years (Since CRM 3.0 beta). I have got overall around nine years of experience working of different CRM Systems and on various different projects related to Microsoft technologies (Dynamics CRM 4.0, CRM 3.0, C#, VB.NET, ASP.Net, MS SQL Server, ASP, VB , Web Services, Window Services ..Etc.). The opinions expressed in this blog are entirely my own. I take no responsablity for the voracity of the content.All information and advice is provided on an ‘as is’ basis with no warranties. I am an crm consultants in Iran basically in Dynamics CRM. I would like if you mind I ask some questions in this area? if you are interested please let me know. although you are so experianced but I hope I can help you in some cases. Yes, you can ask me but if you post in the following forums then you will get your asnwer more quickly.. The plugin needs the code for 2 entities such as 1. Enquiry Notes (Custom entity) and System user entity . 2. Checking rule field( dropdown list with the following values Not applicable,1,2,3,4,5,10,15,20,25). 2. Check required (checkbox) are in disable mode. 4. Find the particular user. 5. Total number of noted created (textbox) has to increase automatically. 6. And verify the checking rule value like say the user has defined the rule for 3. And the count has 3 so that 3%3 =0. 7. If reminder 0 then the Enquiry note’s Check Required (check box) needs automatically selected.